Eric Woolsey Tim McKiernan as Tom Sawyer and Hayley Treider as Becky Thatcher in the Rep's The Adventures of Tom Sawyer. The Adventures of Tom Sawyer Through December 23 at the Loretto-Hilton Center, 130 Edgar Road, Webster Groves. Tickets are $19 to $62. Call 314-968-4925 or visit www.repstl.org. In the lobby after the opening-night performance of The Adventures of Tom Sawyer, the rambunctious holiday offering from the Repertory Theatre of St. Louis, two ten-year-old boys voiced their enthusiastic verdicts. "That was cool," said the first. "I liked all the dead bodies," exclaimed the second, who has the makings of a critic, for he was speaking with admirable specificity. 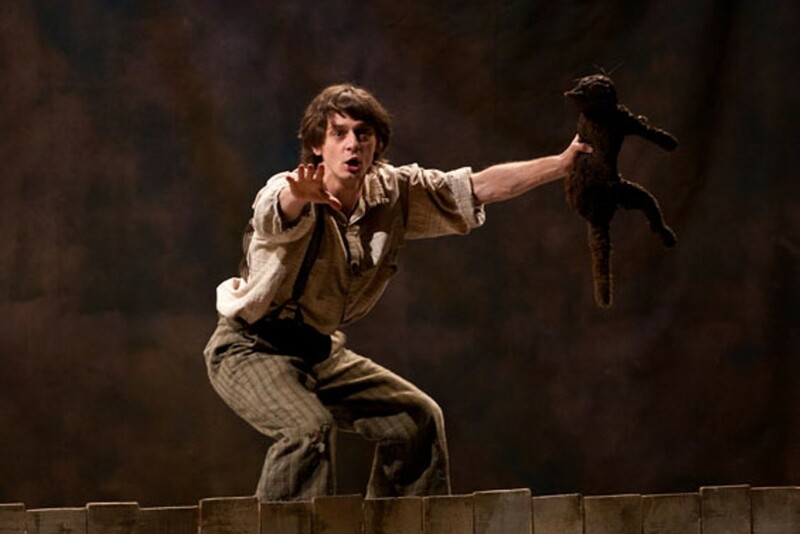 In referencing the "dead bodies" that litter the opening scene of Act Two, the lad tapped into what is most successful about the current stage adaptation of Mark Twain's 1876 novel. What's most successful — and inventive — is its fidelity to Twain. This show aspires to render Tom Sawyer, in both letter and spirit, accurately. Here is an example of what they've done: In the novel, as all Twain fans already know, Tom dramatically saves the hapless Muff Potter from the gallows by identifying Injun Joe as the real killer of the grave-robbing Dr. Robinson, But then, Twain writes, despite the "splendor and exultation" that Tom receives from a thankful community, at night "Injun Joe infested all his dreams." It's easy for a reader to breeze right past those six words. But Laura Eason, who assembled this script for Hartford Stage (where the show came to life before traveling to Louisville and now St. Louis), has used that phrase as the springboard for a nightmare sequence that — though it does not explicitly exist on the page — accurately reflects and even enhances the book's tone. And indeed, the sequence features enough dead bodies to re-involve many a young viewer after the distractions of a long intermission. This is adaptation at its most creative. But if this Tom Sawyer succeeds in amplifying small moments, it somehow manages to get the big things wrong. Onstage, the celebrated scene of whitewashing Aunt Polly's fence plays out without the fence being painted white. (Are we supposed to use our imaginations? No thank you.) And the production doesn't even try to dramatize that exciting moment when Injun Joe crashes through the courthouse window as he makes his hasty escape from Muff Potter's trial. Too many climactic events in this adaptation are not dramatized at all; instead actors recite those narrative passages from Twain's text — which always comes off as a lazy substitute for sustained action. We do, however, get a window where we least need one, in the cave where Tom and Becky get lost. On the other hand, the brooding, ominous sound design for the cave, courtesy of New York-based Broken Chord Collective, seems to be spot-on. The energetic cast is led by Tim McKiernan, who romps through the title role. The other seven actors play multiple parts. Nate Trinrud has more fun as the doomed Dr. Robinson than in his principal role as Tom's dour half-brother Sid. The same can be said of Michael D. Nichols, who seems to take even greater relish in caning students as schoolmaster Dobbins than in knifing his enemies as Injun Joe. 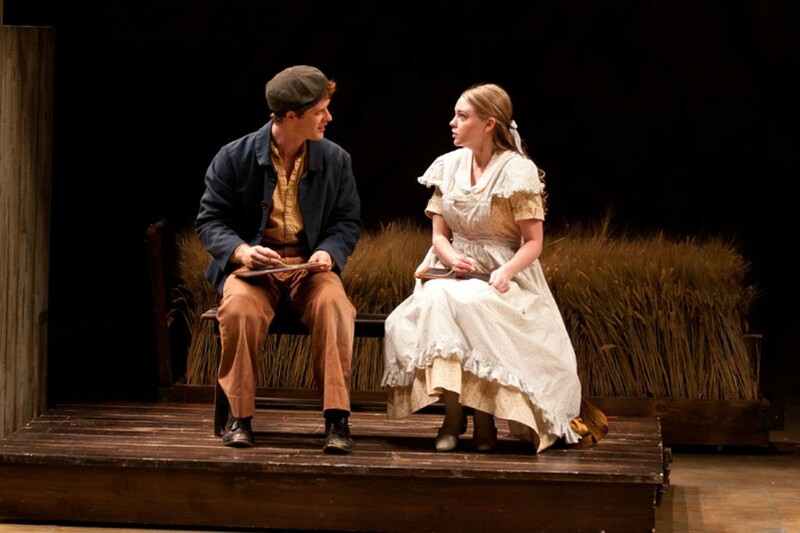 Robbie Tann is a breezy natural as the carefree Huckleberry Finn, and it's easy to see why Tom falls hard for Hayley Treider's Becky Thatcher. Nance Williamson, a forceful Aunt Polly, brings persuasive fervor to all her varied roles. Although Williamson appears to be an actress of range, the truth is that there are no serious acting challenges here. What's most important is that the ensemble conveys a sense of brio and panache, and that its members adhere to the production's exaggerated storytelling approach. Director Jeremy B. Cohen seems to think that everyone who lived in the village of St. Petersburg, Missouri, in the mid-1800s was a candidate for acceptance in the Alvin Ailey American Dance Theater. No one merely makes an entrance. The characters leap onto the stage; they must constantly swirl, twirl and gyrate in a self-conscious manner that does little to evoke a sense of time or place. But the show is pleasantly brief (under two hours), and the pace is brisk. From what I could discern of the opening-night audience, the kids were more engaged than were their parents. Oh, to be ten again.